Emmanuel Macron insisted Britain would 'for sure' be allowed to reverse the Brexitdecision today as he resumed his attack on Eurosceptic 'lies' in the referendum. The French president risked wading back into UK politics by saying leaving the EU was more 'complicated' than voters had thought. The intervention will heap fresh pressure on Theresa May as she desperately struggles to find a way through the Brexit impasse. The PM is facing calls from within Cabinet to consider a Canada-style trade deal with the EU if her Chequers plan fails. Meanwhile, Jeremy Corbyn has issued an ultimatum that Labour will oppose any agreement that does not include a customs union - a red line for Mrs May. Mr Macron - who led a brutal assault by EU leaders on Mrs May's Chequers plan at last week's Salzburg summit - launched his latest salvo in an interview with Bloomberg. Speaking at a climate meeting in New York, he was asked whether the bloc would 'have the UK back' if it decided not to go ahead with Brexit. The EU commission says it will 'keep calm and keep negotiating' despite growing fears over a no-deal Brexit. Spokesman Margaritis Schinas dismissed 'horror stories' that the bloc is ramping up contingency planning in case negotiations collapse. He told journalists at a regular briefing that although the commission was getting ready for all outcomes, the focus was still on getting an agreement. 'Keep calm and keep negotiating,' Mr Schinas said. Diplomats later said the EU will wait until November before kicking off full-blown preparations for no deal. EU envoys from the 27 member states held talks yesterday on stepping up contingency planning. 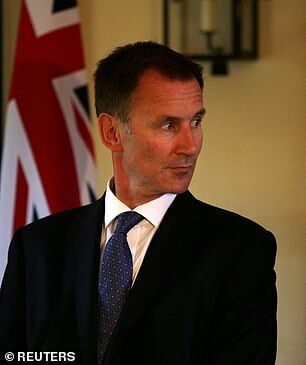 'We will wait for if and when the negotiations with Britain officially fail to kickstart more open work among the 27 on preparing for a no-deal,' a senior diplomat said. 'For sure,' he replied, while stressing that it was not an issue for him to decide whether Britain changed its position and he 'respected the choice' of voters. Mr Macron also resumed his assault on the Leave campaign 'lies' during the referendum two years ago. 'It costs a lot, it's much more complicated than they initially thought,' he said. 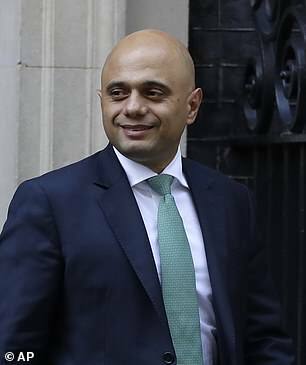 The remarks will heighten tensions amid claims senior Tories including Sajid Javid, Michael Gove, Jeremy Hunt and Dominic Raab harbour doubts over the PM's insistence that no deal is the only alternative to her blueprint. They are keen to avoid a situation where the EU rejects the Chequers proposal at a crunch summit next months and negotiations essentially collapse without a 'Plan B'. However, the group have not presented any new solutions to the issue of the Irish border, according to The Times. With just weeks left to break the deadlock in negotiations, Mr Corbyn is also holding talks Michel Barnier in Brussels amid mounting fears anything that emerges will be blocked by Parliament. Mr Corbyn said he would be urging Mr Barnier and his team to do 'all they can' to avoid a no-deal Brexit. Senior figures including Sajid Javid (left) and Jeremy Hunt (right) are said to harbour doubts over the PM's insistence that no deal is the only alternative to her blueprintThe EU side apparently requested the meeting after learning that Mr Corbyn was coming to Brussels to attend the naming of a square after murdered Labour MP Jo Cox. The encounter will raise anxiety among Brexiteers that Mr Corbyn is plotting with the EU to frustrate the UK's departure. 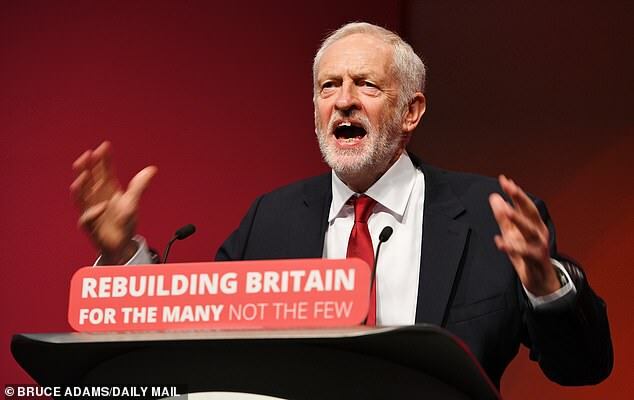 The veteran left-winger used his party conference speech yesterday to insist Mrs May must call a general election unless she is prepared to drop her red line against joining a customs union with the EU. The DUP has delivered a much-needed boost for Theresa May by dismissing a 'vague and contradictory' rival plan for Brexit. 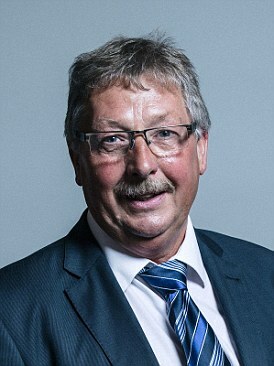 Sammy Wilson of the Northern Irelandparty - which is propping the PM up in power - said a Canada-style blueprint was 'not something we could support'. Boris Johnson, David Davis and Jacob Rees-Mogg were among the Tory Brexiteers who endorsed the plan put forward by the free-market Institute of Economic Affairs (IEA) last week. The paper urged a 'clean break' from Brussels with a 'basic' free trade agreement for goods. It warned that Britain would squander an 'historic opportunity' to broaden its horizons if Mrs May stuck to her proposals. But DUP Brexit spokesperson Sammy Wilson told the Belfast News Letter that the proposals were 'inconsistent'. 'I am not sure if this report is deliberately vague or just not very well thought out,' he said. 'It talks about the goods which are regulated differently in EU member states, and uses the phrase 'of which there are many'. Mr Corbyn couched his demand as 'reaching out' to the PM to get a 'sensible deal' through parliament - but it was denounced by Tories as a naked attempt to gain power. Mrs May says a customs union would deny Britain the opportunity to strike trade deals around the world. Accepting the idea would almost certainly spell the end of Mrs May's time in Downing Street and plunge the Tories into turmoil, making an election and Corbyn government much more likely. Labour has set six tests for a Brexit deal - including securing the 'exact same benefits' - that seem designed to be impossible to pass. The conference also agreed that if the party cannot force an election, the option of holding a referendum should be kept 'on the table'. There was a glimmer of light for Mrs May today as it emerged the DUP has dismissed a 'vague and contradictory' rival plan for Brexit. Mrs May and Mr Macron looked to have buried the hatchet at a UN meeting in New York last night after their explosive fallout over Brexit. 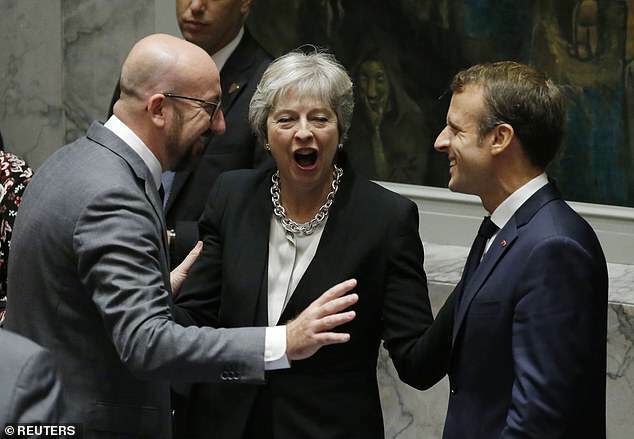 The two leaders were seen exchanging kisses of greeting before laughing and joking alongside Belgian premier Charles Michel. 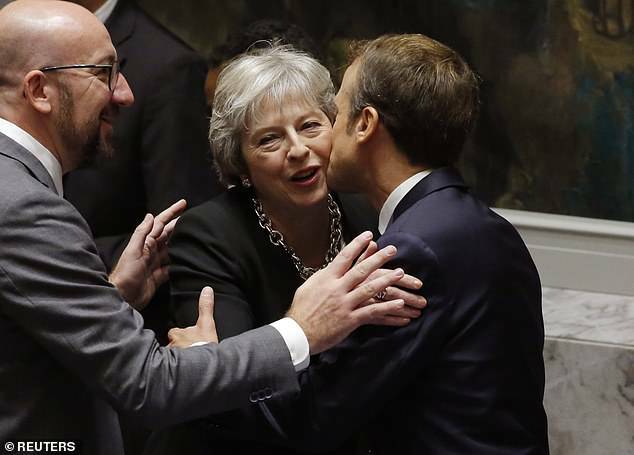 The warm scenes were a million miles from the Salzburg summit last week - when Mr Macron led a brutal assault on Mrs May's Chequers plan for Brexit. The PM had hoped to get a signal from her EU counterparts that they were close to a deal on the future relationship. But instead the Frenchman pushed his colleagues into issuing a blunt statement that Mrs May's blueprint 'will not work' as it would undermine the single market. He then flouted diplomatic convention by wading into UK politics, delivering an extraordinary rant about how the British public had been tricked by 'liars' during the referendum in 2016. The backlash left Mrs May visibly shaken in Salzburg, before she regrouped and made her own defiant statement from No10 accusing her colleagues of lacking 'respect' for the UK. 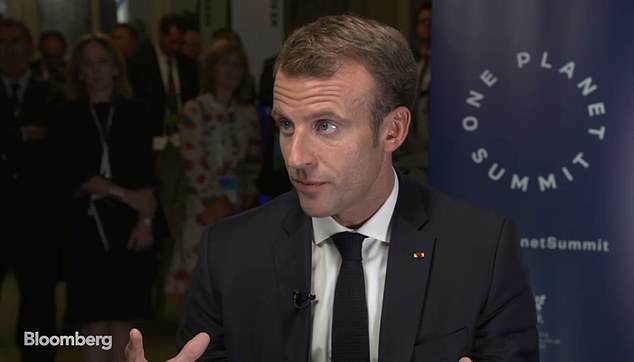 Despite the more cordial tone of their encounter in New York yesterday, there is little sign that Mr Macron is minded to back down in his condemnation of Mrs May's blueprint - which would effectively keep Britain in the single market for goods. He is said to have threatened to boycott a looming summit in November that could seal a deal unless the the PM bows to demands over the Irish border. The EU insists Northern Ireland must stay within its customs union to avoid a hard border - but Mrs May says this is totally unacceptable as it would split the UK.